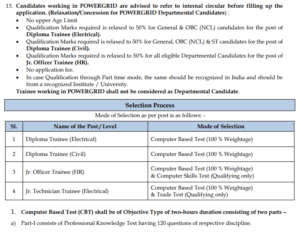 PGCIL Diploma Trainee Recruitment 2018: Jr Officer, Technician Vacancies – On 12th September 2018, under Advertisement number ER – II/ HR/ Rectt/ 2018/ 01, A government of India Enterprise – Power Grid Corporation of India Limited has released a PDF notification for Recruitment for the post of Diploma Trainee (Electrical); Diploma Trainee (Civil); Junior Officer Trainee (HR) and Junior Technician Trainee (Electrical) for ERTS – II, Power Grid. 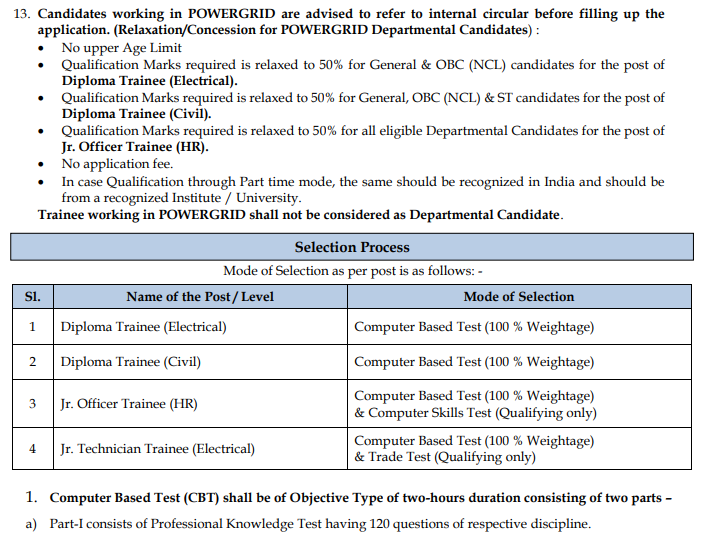 Board has also informed that Admit Cards will not be sent by post and will only be available to download from the official website having URL – https://www.powergridindia.com/er-ii-recruitment. Giving you more details about the Application Fees, ex-servicemen, persons with disability, scheduled tribe, scheduled caste and departmental candidates need not pay a single penny as a part of registration fees. While candidates falling under categories other than these will have to pay application fees of Rs. 300 for the post of Diploma Trainee (Electrical/ Civil) & Junior Officer Trainee (HR)) and Rs. 200/- for Junior Technician Trainee (Electrical). All the important dates have been clearly mentioned by the Board of Controller of Examination and Recruitment apart from Date of Computer Based Test (CBT) and date of release of Admit Cards online on an official website. Besides, 2nd October 2018 is the cutoff date for the purpose of upper age limit criteria, 4th October 2018 is the last date of payment of application fee (for registered candidates only), 2nd October 2018 as the online registration closing date and 12th September 2018 as the online registration starting date.